Most buyers release, change and cancel purchase orders every day. The majority of ERP systems automate the process of creating purchase orders based on the MRP recommendations. Then, what separates a mediocre system from a truly good one? While the above process works fine within the boundaries of the company, there’s no guarantee that the supply system is in line with your purchase orders. The supply chain doesn’t stop at the point of releasing the PO from the ERP or adjusting for changes in demand. The presence of an end to end process determines whether a system is mediocre or excellent. TPSynergy helps in PO management by extending the ERP system into the external world by providing a single source of information for collaborative order management. 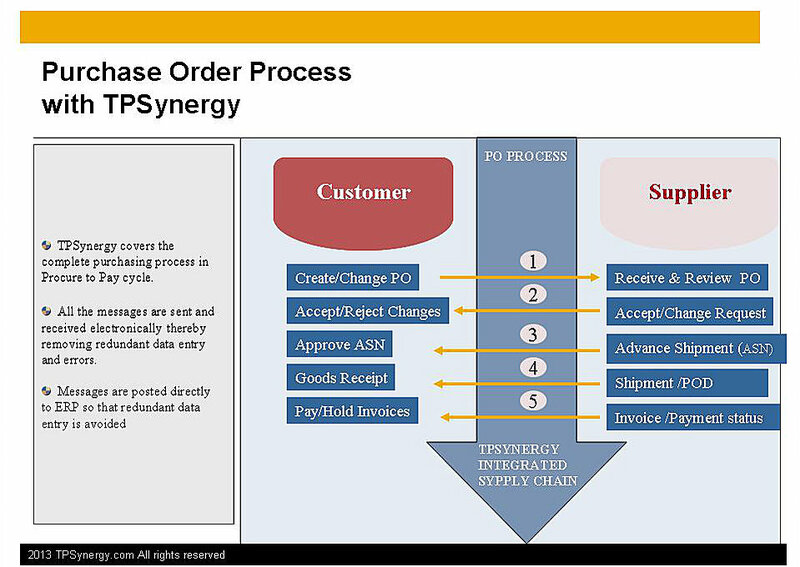 ERP is integrated to the external world by TPSynergy’s Order Collaboration Platform. Orders and order changes are seamlessly integrated into real time to the collaboration portal, and visibility is ensured from end to end in the ordering process. TPSynergy supports various Order Types used in the industry. Each order type can have a different process and life cycles. The process can be configured as per your business process. When new purchase orders are released from ERP, it automatically syncs to the collaboration portal and is available for the suppliers to confirm receipt of the purchase order. It also syncs to the supplier’s own ERP system automatically. This removes the ambiguity over whether or not the supplier has received the purchase order. Similarly, any changes made to the orders in the ERP system automatically update the PO status in the portal. As a result, the supplier can’t ship the wrong quantity or ship for a wrong PO that is no longer needed. This ensures there is a tighter control on the PO shipping process by the buyer. Important developments and imminent bottlenecks in the supply chain are immediately notified and attended to. For example, you are notified when a supplier does not ship within the ship window. Alert functions and automated monitoring increase supply chain transparency.